Plant Improvement and Somatic Cell Genetics includes all but one of the papers presented at two symposia held during the XIII International Botanical Congress in Sydney, Australia, on August 21-28, 1981. ""Frontiers in Plant Breeding"" and ""Cell Culture and Somatic Cell Genetics in Plant Biology"" highlight the ways in which plant breeding techniques can improve crops. 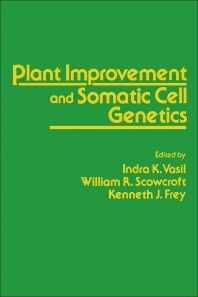 The book explores the potentials as well as the limitations of plant breeding, and cellular and molecular techniques in plant improvement. Comprised of 14 chapters, this volume begins with an overview of the potential applications of exotic germplasm for tomato and cereal crop improvement. It continues with a discussion of multiline breeding, breeding of crop plants that can tolerate soil stresses, combining genomes by means of conventional methods, use of embryo culture in interspecific hybridization, use of haploids in plant improvement, and somaclonal variation and somatic hybridization as new techniques for plant improvement. The reader is also introduced to plant cell culture, as well as somatic cell genetics of cereals and grasses, somatic cell fusion for inducing cytoplasmic exchange, uses of cell culture mutants, genetic transformation of plant cells by experimental procedures in the context of plant genetic engineering, and use of molecular biology techniques for recognition and modification of crop plant genotypes. This book will be a useful resource for scientists and plant breeders interested in applying somatic cell genetics for crop improvement.